We are trying to remain a quiet little fishing village while making room for tourists and vacation visitors. 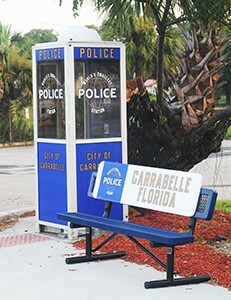 We still have our “Smallest Police Station in the World” (it’s a phone booth) on US 98 at the corner of CR67. The original is now on display in the Chamber Office, located at 105 St. James Ave (U.S.98) in downtown Carrabelle, and can be seen Monday through Friday, from 10:00 am to 2:00 pm. The World’s Smallest Police Station” came into being on March 10, 1963. The city had been having problems with tourists making unauthorized long distance phone calls on its police phone. The phone was located in a call box that was bolted to a building at the corner of U.S. 98 and Tallahassee Street. Johnnie Mirabella, St. Joe Telephone’s lone Carrabelle employee at the time, first tried moving the call box to another building, but the illegal calls continued. Mirabella noticed that the policeman would get drenched while answering phone calls when it was raining. So when the telephone company decided to replace its worn out phone booth in front of Burda’s Pharmacy with a new one, he decided to solve both problems at once by putting the police phone in the old booth. With the help of Curly Messer, who was a deputy sheriff at the time, Mirabella moved the phone booth to its current site on U.S. 98 under the chinaberry tree. The booth did protect the officers from the elements, but some people still snuck into it to make long distance calls. Eventually the dial was removed from the phone, making it impossible for tourists to make calls. It has been featured on television shows “Real People”, “Ripley’s Believe It or Not”, “The Today Show”, “Johnny Carson”. It was featured in the movie “Tate’s Hell” which was produced at Florida State University. Along with police station T-shirts – the design is copyrighted – there are police station hats, visors, postcards, and calendars. But life has not always been easy for the retired St. Joseph Telephone and Telegraph Company phone booth. Vandals have ripped phones out of the booth and shot holes through the glass. It has been knocked over by a pickup truck, and a tourist once asked a gas station attendant to help him load it into his vehicle to take it back to Tennessee and it was knocked over and damaged by Hurricane Kate.